Supporting construction all made of die-cast aluminium with CNC-machined fits. 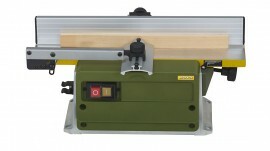 Pre-condition for vibration-free, clean planing of soft and hard woods. The heart of the machine: Ball-bearing mounted planer block with exchangeable HSS blades. Belt-driven by special low noise DC motor. Plane-milled table, of which the right table half is fine adjustable via toggle screw. Adjustable longitudinal stop, to both sides inclinable through 45° (scale available). Practical safety milling protection that does not interfere during work. Main switch with emergency-stop and restart protection. Including suction connection and push stick. 230V. 200W. 50/60Hz. Table 400 x 80mm. Planing width 80mm. Maximum chip removal (infeed) 0.8mm. Speed 6,000rpm. Weight 5.5kg. Insulated to class 1.